3D printed spaceship and rocket parts are cost effective, durable, and reliable. i3D MFG uses Direct Metal Laser Sintering/Melting, or DMLS/DMLM, to manufacture these components in designs not possible with traditional machining or casting. 3D metal printing allows for the production of parts made from exotic metals, such as Copper, Inconel, Haynes, Monel K and titanium, and feature highly complex geometries. Because DMLS uses a 3D model to direct its lasers to fuse material together precisely where the part is built, there is no scrap metal or waste produced. 3D printed spaceship and rocket parts reduce the costs of printing in rare metals like titanium and Inconel by 50 to 70%. 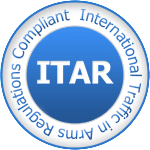 i3D MFG™ is ITAR registered with the U.S. Department of State and follows ITAR protocols in our Bend, Oregon and The Dalles, Oregon locations.